Fueled by technology, our society is obsessed with the new and next big thing. While neomania drives our ability to continually ideate/design/build/ship, it also leaves little time for introspection and reflection. I’m no exception. I have a genuine love for enrichment through education, and my brain acts as a sponge, absorbing knowledge and constantly seeking its applications. This time last year, I set out intent on ensuring that my learning did not stop simply because I was no longer in an academic setting. Over 52 weeks, I read 52 books, listened to 500+ hours of podcasts, perused thousands of articles/blog posts, and enjoyed a myriad of interesting conversations. But ingesting information for the sake of information isn’t nearly as valuable as digesting it, drawing your own conclusions, and sharing it with others. There is tremendous value in pausing to look back on all that has been gathered to connect the dots. Dakota Shane Nunley wrote a great piece reflecting on his life learnings from this past year so I wanted to write some of my own takeaways in hopes of paying tribute to my contemporary mentors. From doctors and economists to venture capitalists and everyone in between, a new generation of thinkers and creators are leading the charge to change the world. The following 5 points were key lessons they expressed or demonstrated time and time again that we can apply to better our own lives. It seems counter-intuitive. Constraints usually hold negative connotations, but positive ones can help keep our harried lives in check. Once we identify our priorities, we can set rules around them, which in turn can be incredibly liberating. For many successful individuals, waking up at or before 5am was the norm. This gave them ample opportunity to read, meditate, spend a few hours devoted to their most important morning rituals. For others, I often saw a recurring commitment to spend time with loved ones sans tech. Emails were only to be checked at certain times of day and time off meant time unplugged. These micro decisions did not come at the expense of convenience. Instead, they behaved as guidelines to optimize happiness. Very few people interviewed or written about knew exactly what they wanted to do/be when they grew older. Some had a semblance of the industry they wanted to be in or some functional role they wanted to occupy, but the most impressive, knowledgeable leaders revealed a non-linear career progression. By being unafraid to replace what they do with what they aspired to do, they opened doors to meeting people and being exposed to new industries. This provided unique opportunities to grow and be challenged while others around them provided support and resources. Look at the diverse careers of John Maeda, Andrew Chen, and Karlie Kloss. Heck, look at the Rock (ahem, that’s Dwayne The Rock Johnson). They are proof that success is not just one upward vertical climb. Look at this awesome iceberg image. That is why every single accomplished person is obsessed with whatever it is they do. Success is bright and shiny and easily celebrated. What is rarely highlighted is the grueling work it takes to get there. To get better at something, it takes commitment and diligence. 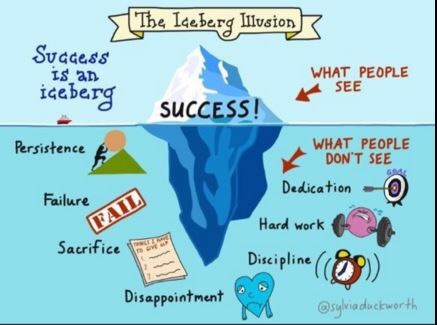 Atul Gawande said that “[betterment] does not take genius…it takes a willingness to try.” No one writes about what lies beneath the tip of the success iceberg because more often than not, diligence is mundane. So find something to be obsessed with to make the hundred thousand steps to betterment worthwhile. The importance of user experience was stressed above all else this year. Especially when it came to technology and digital content, the maturation of the web meant that design remained as a key product differentiator. It’s easy to write off great design because good design solutions feel obvious. Facebook designer Julie Zhou and sushi chef Jiro Ono both understood that mastering the art of simplicity entailed a deep understanding of complexity’s depth and being able to strip away the non-essentials. This process calls for a venerable number of iterations, a painstaking attention to detail, and a holistic understanding of the essence of a product. Without such meticulous behavior, we would have been stuck with functional products that never graduated to become the usable and beautiful products we know and love today. Ask honestly and listen earnestly. Doing so can only spread a little more empathy to the world. Consolidating a full year’s worth of knowledge into five points almost does a disservice to the collective wisdom of all the information out there. It’s been humbling to have access to so much, only to realize that what I have learned only scratches the surface of many of these subjects. But I’m also excited. We can learn via almost any medium today and as more and more people around the world gain access to the web, anyone with internet connection can access this knowledge. We can learn more, faster, better than ever before so long as we are humble enough to admit what we don’t know. All of these lessons remain tried and true, and as we head into another year, I can only hope to continue learning and adding to this list. For anyone who is curious, you can find my 2015 reads here, and I always welcome book/podcast/article suggestions via my twitter @minney_cat. The quantity and quality of information I ingested this year would have been impossible without the help of some of my new favourite apps. Even within the veritable mountain of quality content out there, Overcast, Pocket, Medium, This.cm, and Airtable were instrumental in gathering, recommending, organizing, and consolidating the very best to help me on this educational journey. I’m taken aback by how intent you are to understand and share the things you learn. It invigorates me because you cover topics of fundamental importance. Reading this motivates me to read more, listen more, and to question more. To sum how this article made me feel, it just makes me want to become a better person, especially for the new year. It’s really inspiring. In order to achieve tasks like this one needs a strong motivation. Would you mind sharing what’s the motivation behind this effort? Thanks in advance.